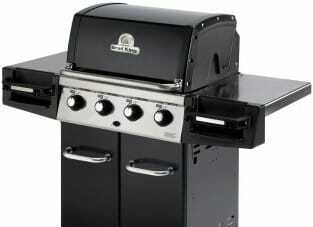 Ceramic Smokers, Charcoal BBQ's, Best Sellers, Pizza Ovens. Often copied, but never equaled. Patented components and state-of the-art ceramic technologies have produced unrivalled insulation, thermal shock tolerance and material strength. The high-quality ceramic was initially developed by NASA for their rocket heat-shields. The EGG’s durability, quality and sleek design are so admired that many EGGs are passed down from one generation to the next due. 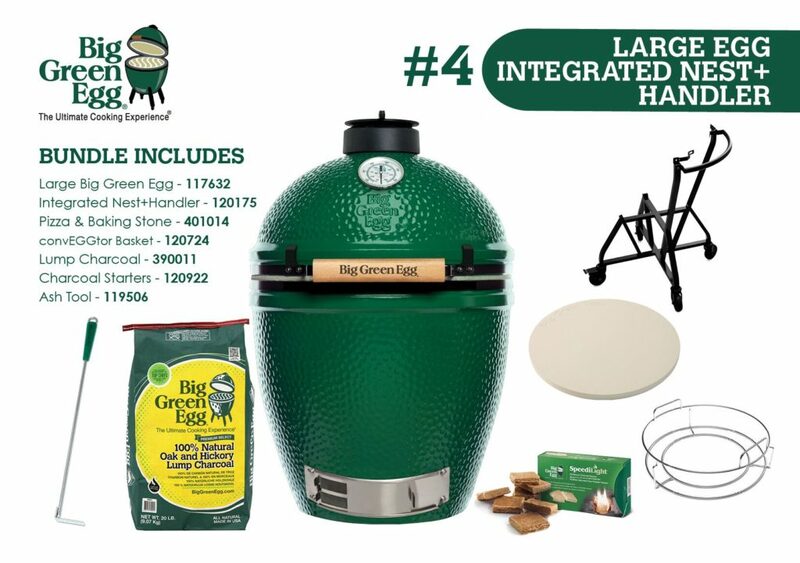 For additional peace of mind, the Big Green Egg comes with a Best-In-Class, limited lifetime warranty. Throw out all your old BBQs! 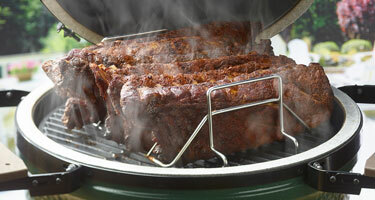 With the Big Green Egg you can Grill, Roast, Smoke and Bake. It is easy to master searing steaks and burgers, roasting legs of lamb, slow cooking ribs and baking pizzas and breads. You can cook everything on the one Big Green Egg. The Big Green Egg reaches cooking temperature and is ready to use in just minutes. Big Green Egg brand natural lump charcoal is made in the USA from oak and hickory for superb performance and results. 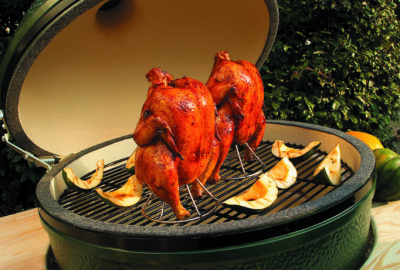 Lighting the charcoal is quick and easy, as the design of the Big Green Egg allows air flow to work like a fireplace. Use a natural charcoal starter or an electric starter; and never buy lighter fluid again! By simply adjusting the patented air flow controls, you can reach and maintain desired temperatures to within a few degrees! Due to the EGG’s world class ceramic composition and design, outside temperatures won’t affect temperatures inside the EGG so you can use it all year around. 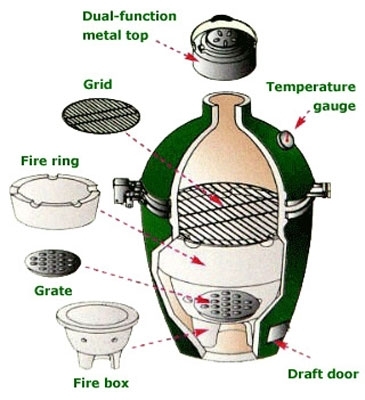 The Big Green Egg is extremely safe to use because the ceramic surface doesn’t get as hot as a metal grill, and the heat source is protected within a ceramic fire box inside the base. The Big Green Egg features a stainless steel cooking grid and an elegant green exterior with a lifetime glaze that maintains its good looks and wipes clean easily without chemical cleaners. Just like a self-cleaning oven, residual heat burns away any grease build-up inside the EGG. 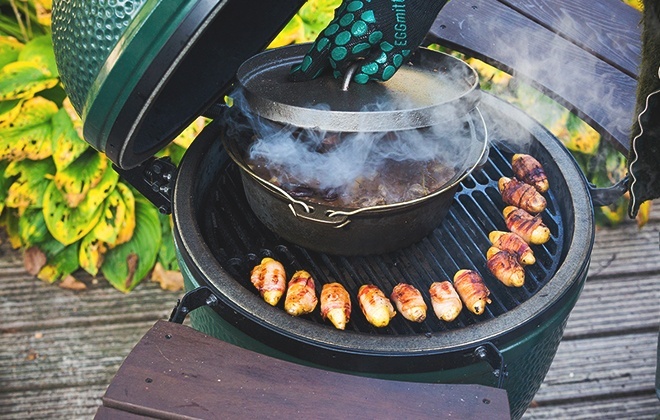 Unlike tradition gas grills that use gas and are made from metal, the Big Green Egg is fuelled by natural lump charcoal and made from shuttle-quality ceramic that retains heat and moisture better than any other cooking unit today. And with the EGG, cooking takes place with the lid down so that heat, moisture and flavour is preserved to perfection. 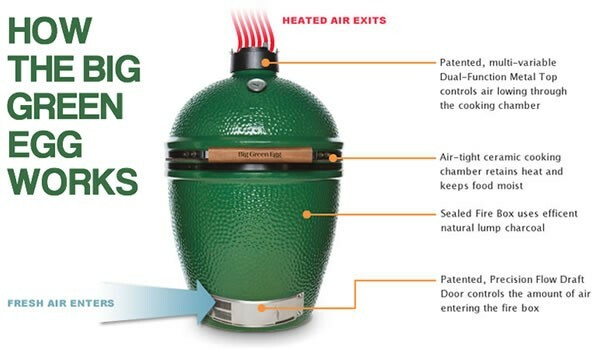 Temperature and smoke quantity in the Big Green Egg is controlled by a patented air flow system. The Draft Door and the Dual Function Metal Top act as vents that regulate the amount of air flowing in and out of the EGG. Put simply, the Draft Door determines the range of temperature (particularly the upper limit), where as the Dual Function Metal Top is used for achieving finer adjustments to within a degree.